There are a few common mistakes people make at high-altitude. In this blog post I detail seven of these mistakes. Ignore them and some could have deadly consequences. 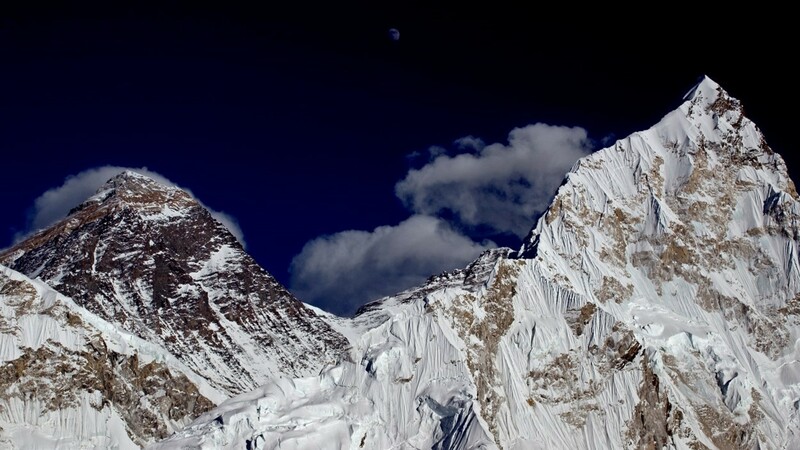 High-altitude is defined from around 2500m and above. From this altitude you need to be vigilant of the symptoms of altitude sickness or Acute Mountain Sickness (AMS). AMS can potentially lead to HAPE and/or HACE, both life threatening conditions. 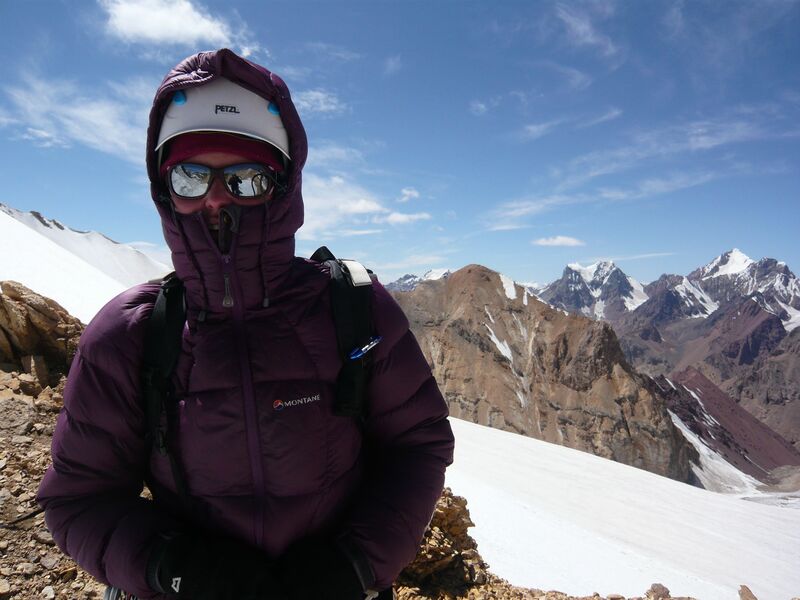 Beyond altitude sickness, the high-altitude environment presents other challenges which can affect physical health, as well as increased psychological demands. To avoid feeling unwell and having a low chance of success, don’t make these seven sins at high-altitude. Ascending too quickly, before the body is acclimatised, is the number one cause of problems at high-altitude, yet it is almost entirely avoidable. To reduce the chances of becoming ill from the altitude it is crucial to plan a gradual ascent profile. By not ascending too fast, too soon, the body has the best chance to acclimatise. It is important to understand that ascent profiles are measured not by the maximum altitude gained during the day, but by which altitude is slept at. In fact, ‘climbing high, sleeping low’ is beneficial to acclimatisation. If you’re planning your own trip, design an itinerary around the recommended ascent profile. With a company, don’t be tempted by cheaper trips. They are often shorter and consequently have faster ascent profiles. These are a false economy as the chances of success are lower whilst increasing the chances of being unwell. The research-based Wilderness Medicine Society recommends no more than 500m (some recommendations are as low as 300m) to a new sleeping altitude each day after reaching 3000m. Take one rest day, with no increase in sleeping altitude, every 3 or 4 days. Stick to this and you give yourself the best possible chance of success. For more advice about travel at altitude I’d recommend this leaflet which has been put together by medical professionals with an expertise in altitude medicine. Without the ability to adapt an itinerary a team can run short of time and have to turn back, unsuccessful. There are lots of different reasons that a team might want to have a few extra days planned. People acclimatise at different rates, illness as well as logistical hiccups can cause delays (the classic being flights in and out of Lukla). Having extra days at the end of a trip means that extra rest days can be taken and logistical problems don’t comprise the trip. This both increases the chances of success and makes a trip far less stressful. Interestingly, a greater incidence of altitude sickness has been reported in trekkers in larger groups, compared to small group treks and independent trekkers. Large groups aren’t able to be as flexible to individual needs and there can be limited time between finishing a trek and international flights which puts pressure on the itinerary. 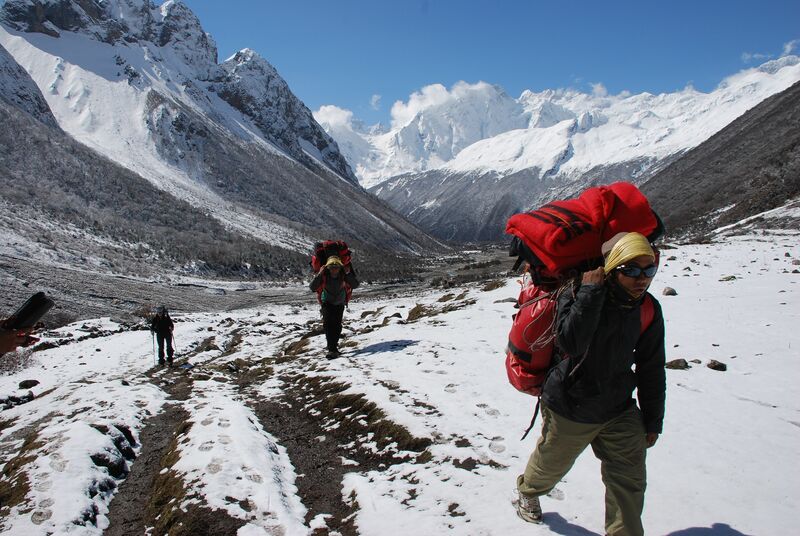 Small groups and independent trekkers, on the other hand, are able to chop and change their plans more easily. This is particularly advantageous at altitude where it is not possible to increase the length of days to catch up on the itinerary due to ascent profiles. Good nutrition and hydration mean that our body has the fuel it needs to perform. If it is in deficit the body becomes run down, physical performance reduces, and people become vulnerable to illness. The cumulative effect of even a small deficit adds up over long trips. A common effect of high-altitude is the loss of appetite, but food is essential for energy, salts (which stop cramp) and morale. Even if someone doesn’t have any appetite it is important not to deprive the body of the energy it needs. Eating even not feeling like it is a must. This is easier if expedition food is appetitising and varied. 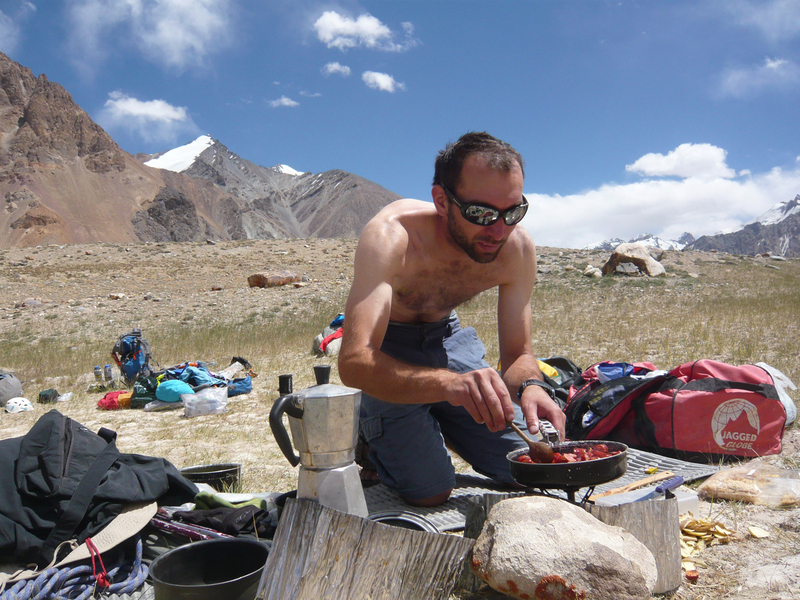 This article is an excellent read for more information on nutrition in the mountains. Dehydration at high-altitude can easily occur without people realising. Despite cold temperatures, the body’s physiological response to acclimatisation as well as the drier air compared to temperate climates, mean that it is easy to underestimate how much you need to drink. Being aware of the fact that it’s easy to become dehydrated and compensating by drinking plenty is important. I focus on rehydrating in the mornings and evenings, and then just topping up during the day. Here is more detailed information on hydration for mountain athletes. At altitude ignorance is definitely not bliss. Not appreciating how tough the high-altitude environment is one error. Conversely, not realising that our bodies do acclimatise, and instead becoming overwhelmed with the challenge ahead, to the point of it feeling impossible, can also be a problem. When planning a high-altitude expedition or trek, factor in that even the simplest thing is more difficult at high-altitude. Not only is there the physiological impact of high-altitude, but the feeling of remoteness can be overwhelming. In addition, the length of trips is mentally-wearing especially when experiencing high-altitude for the first time. Failure to acknowledge this in the planning means that it is easy to be overambitious. To prevent being overambitious research the trip before you go, practise skills and get fit. However, the best advice is to reduce the technicality of the expedition aim by a notch or two, especially when going to a new altitude for the first time. Once experience has been gained the difficulty of an expedition can be increased. Conversely, being psyched out and overwhelmed by a challenge when it is actually achievable is common. I see this in those experiencing high-altitude for the first time and have had a tough day at a new altitude. With experience, you realise that the process of acclimatisation does work and when returning to that altitude later in the trip it feels much easier. High-altitude, and long trips, wear people down. Everyday can be hard work and people can get to a point where they feel like it’s impossible to achieve the summit. Shifting the focus off summit day, or that day in the trek itinerary which has been billed as the hard day, means that the trip is much more enjoyable and people aren’t worrying about things that are out of their control. In fact, for both types of ignorance, overestimating and underestimating abilities at high-altitude, the best advice I can give is to take each day as it comes. I often ban discussion about summit day until a few days beforehand, so much can happen between the start of the trip and then. By always be talking about one day it can make people feel anxious and stops them enjoying every other day of a trip. This point also ties into flexibility. Having a Plan B (C and D) means that if an objective is too tough then is it easy to alter the plan. It also takes the mental pressure off. Mountains don’t go anywhere, the summit is always there for another day. Rest days are not for lying in a tent sleeping. Rest days are for preparing for the days ahead and acclimatising. Typically, rest days can be used for checking equipment, washing – clothes and yourself, eating and hydrating. To aid acclimatisation it is a chance to stretch the legs, even gain a little height. I’ve found gentle exercise on rest days makes a huge difference to both acclimatisation and keeping my body and mind ticking over. Even an hour’s wander around camp helps remind my body what it’s meant to be doing – acclimatising. It also keeps the mind active and ‘on the job’. I’ve seen climbers allow lethargy set in, and felt it creeping in myself. Sometimes it’s after being tent-bound due a storm, sometimes after multiple rest days relaxing reading books and playing card games. Suddenly the desire to climb seems to disappear and motivation hard to regain. Now, my mantra is that there are no days off at high-altitude. The high-altitude climate is extreme, so much so that both the sun and the cold are a challenge at altitude. Combined with this there are challenges associated with living for a prolonged time in a tent and travel in developing countries. Neglect to protect yourself against the harsh environment or potentially unhygienic conditions and you could have trip-ending health problems. At high-altitudes is can be surprisingly hot during the day. Dehydration, and even heat illness, are a potential problems. Combined with this, the sunlight is exceptional strong due to the thinner air and reflection off snow, and humidity low. This can cause exposed skin to dry and crack. Lips are vulnerable to sunburn and/or cracking which is incredibly painful and causes difficulty eating. Protect lips by using a high SPF (min 30) lip balm. At night I use Vaseline to repair any damaged skin. In addition, protect exposed skin with suncream of at least SPF 50, a hat, long sleeves and a lightweight pair of gloves. Remembering to apply suncream especially to easy to forget places like on the tops of the ears, backs of hands and underneath the nose and chin. Reapply it regularly and cover up with lightweight clothing. To protect the eyes use Category 4 sunglasses and goggles. If the eyes are exposed to the brightness of the UV light reflecting off the snow, painful snow blindness can result. Recovery means several days in a dark room or tent and often a premature end to an expedition. The dry atmosphere can also lead to other problems like a sore throat and dry cough. I always take a supply of throat lozenges to ease any sore throats. A method of prevention is to try breathing through the nose, rather than mouth, to protect the throat getting irritated by the dry air. When the sun goes behind the mountains temperatures plummet and cold injuries and hypothermia are a risk. Wind chill increases the risk further. I’ve written several detailed blog posts on staying warm in the mountains as well as how to keep extremities warm. Some general tips involve changing damp layers, like socks and base layers, as soon as you are in camp, using a layering system and good wicking fabrics next to the skin. Prevent sweating by adopting the ‘be bold, start cold’ philosophy. If you are moving but are still cold then you need to stop and put a layer on. For a quick fix have a hat and gloves in you pocket so you can do this on the move. At high-altitude there can be a high occurrence of stomach problems. I’d say stomach bugs are up there with altitude sickness in contributing to unsuccessful trips. To avoid picking up a bug the most important thing is scrupulous hand washing, particularly before meals and after using the toilet. Soap and water is best, and many base camps will have a good hand washing station set up. A nail brush also helps to remove dirt beneath fingernails. Whilst on the move a small bottle of antibacterial gel is useful. Other health issues can occur from the combination of physical activity and lack of washing facilities. These can be wide ranging and include skin problems like chafing, blisters and irritation of pre-existing conditions such as eczema to fungal infections. My top tip for washing at high-altitude is to do it in the middle of the day when it’s warmest. If trekking with porters I put my wash kit and a towel in my day pack. When we stop for lunch I take the opportunity to have a quick wash.
Keeping clean and protecting yourself for the harsh high-altitude environment is hard work but neglect these details and the environment won’t discriminate in it punishment. A ‘I’ll make do’ attitude rare results in a successful trip. If you think you should be altering layers, washing your hands more thoroughly or reapplying suncream, then you probably should be. 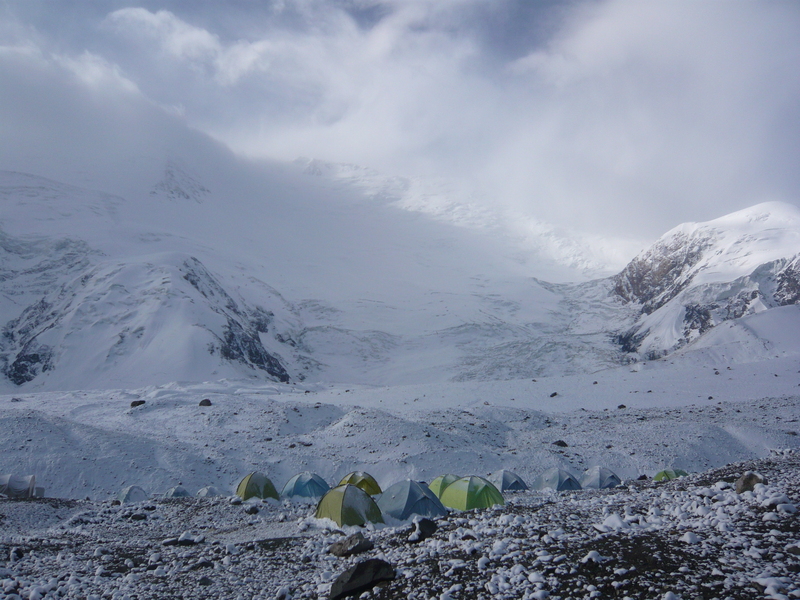 Nearly all expeditions at high-altitude involve a team. This may be a team of climbers and /or a local team including porters, cooks, local guides and people looking after pack animals. No matter what the position or role of a person it is important that everyone is considered an equal member of the team and no one’s individual needs is greater than another’s, or what is best for the team as a whole. The team is an expedition’s strength, recognising that success is integral to how successfully a team operates is key. Within the team there must be similar tolerances to risk, a deep understanding and trust as well as good communication and desire to find solutions to problems. All of these result in well-functioning team in the mountains. If the team fractures, the expedition falls apart. As a member of a team individuals have the ability to create a positive environment by being considerate to others and thinking about team needs over their own For example, a simple action which reduces frustration in a team and increases efficiency, is to make sure that at allotted breaks everyone does all the things that they can’t do whilst walking or climbing. This means adjusting layers, going for a pee, applying suncream, taking photos, eating and drinking. It prevents unnecessary stops which result in others getting cold and frustrated. Putting effort into team wellbeing is time well spent. It may mean taking an extra rest day, adapting plans for the porters needs or stopping to let a team member sort out a hot spot before it becomes a blister. There is no place for selfishness in the mountains. What sins have you committed at high-altitude? Do you have any experiences to share about what not to do in the high mountains?